Eclipso holds the citizens of the small town called Crater Bay in his grasp. Unable to find a way to thwart him, Superman goes to offer Eclipso a deal... if Eclipso will relinquish his hold on those people, he can have Superman. This is a deal that Boostter Gold, Fire and Ice are not very satisfied with. The three heroes meet with Lex Luthor and Emil Hamilton, who believe they've rigged a massive solar trap that might be able to generate enough sunlight to flood the town of Crater Bay, driving Eclipso out from everyone caught in the blast. But the trap is massive, and the three heroes can't possibly hope to move it themselves.Ice recruits Captain Marvel to help set up the solar trap, as well as to hold Eclipsed Superman long enough to catch him in the blast. 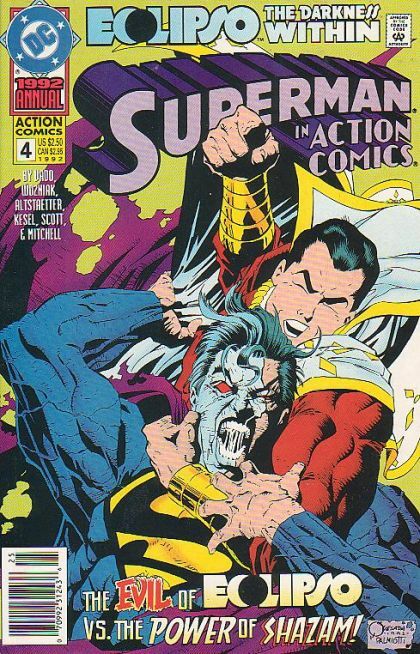 But controlled by Eclipso, Superman fights much harder than Captain Marvel is used to. Can he slow the man of steel down long enough for their plan to work?